most edge of the region on the coast. Other cities that deserves mentioning are Monfalcone, Pordenone, and Udine all of which are to the north west of Trieste. 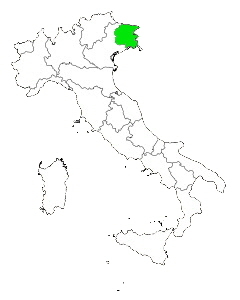 The Friula-Venezia Giulia region also shares borders with only one other Italian regions which is Veneto to the west. The region has about 55 miles of coastline but with the exception of the small beach resort built in Trieste for the most part there aren't any beaches to speak of that are touristy. However there are some small beaches scattered around between the mostly rocky and cliff covered coastline which the local population use. Because this region isn't very heavily traveled by tourists the region remains a quiet and friendly place to visit and relax. Being one of the most remote regions of Italy Friula-Venezia Giulia has many thriving industries more so in the costal areas rather then deep in the region.